Welcome to the Sonja Library! 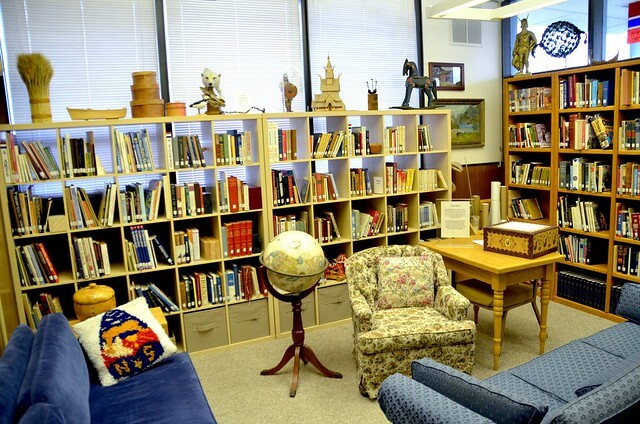 Sonja Lodge Library is a collection of books and other items pertaining to Norway's history, literature, politics and culture. The physical library has the square footage of a large bedroom with bookshelves on three of the walls and ample natural lighting from high windows on two of the walls. The collection of 2000 books is cataloged and very useful. Loans of the books are on the honor system. Members are asked to sign for the books so the volunteer staff knows where they are. The two most notable sections are Norwegian fiction and history. The books of scenic Norway are also most impressive. Most of the books are in English, but there are a few hundred in Norsk. In a typical month about fifty books are borrowed. Most of the books have been donated by members, but many have come from non-members who know about the library. Members and guests frequently sit in the library and visit. It's an attractive room with comfortable furniture which makes it a popular site. Art and objects relative to Norway are on display. Our collection of Viking magazines runs from 1975 to the present. All are indexed for easy use in finding past articles. Other magazines that are useful are Vesterheim, Norwegians Worldwide and Norwegian-American Weekly, all in the “clipping collection” which is indexed locally by our library staff and the issues are kept in a large vertical file. It’s all categorized by subject. Thousands of clippings of Norwegian interest are included.